Placenta encapsulation is the process of turning the placenta into medicine for the mother after the birth. The method of encapsulation I follow is the TCM (Traditional Chinese Medicine) approach. Using this approach, warming herbs (ginger and hot peppers) are added to the placenta to bring heat back to the body, because in Chinese Medicine the idea is that heat is lost at the time of birth. While placenta medicine has been used in Chinese Medicine for centuries, it wasn't until the 1980s that an American midwife, Raven Lang, who also studied TCM, introduced this practice to American midwives at a conference. I offer placenta encapsulation to my midwifery clients who are interested and to any clients having their babies elsewhere who are interested in this service. I will pick up the placenta wherever you have your baby and return the medicine to you within 24-72 hours. Catherine has completed an OSHA-approved 'Bloodborne Pathogens for Placental Encapsulation Professionals' course, follows OSHA safety standards when handling placentas, and sterilizes all equipment used before and after each use. 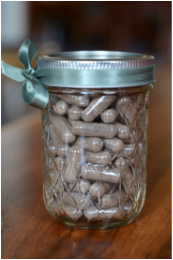 Contact Catherine to request Placenta Encapsulation services or ask any questions you may have! How much do placenta pills cost? Placenta medicine costs $200 and this includes picking up the placenta at your home, at the birth center, or at the hospital, encapsulating your placenta, and delivering it back to you at home a couple days later. For midwifery clients who are in our care for their home birth, we charge $150.